Baska abounds with thirty pebbled beaches accessible to swimmers of all ages. Some of them can be reached by foot or by boat. The biggest and one of the most beautiful beaches Vela's Baska, which is located in the town center is surrounded by bars, restaurants, pizzerias, cafes, hotels, private apartments and other amenities that are an integral part of the place. Vela is a natural beach pebble beach, 1800 m long, it can take several thousand swimmers. It is especially suitable for children and non-swimmers. 1. The hotel complex Corinthia consists of 3 interacting parts; Corinhia I and Corinthia II/III. Hotel Corinthia I is located by the sea and it was constructed in three phases. Together with its central building, which was terminated in 1999, the complex is the heart of tourism in Kvarner. With a continuous renewal proces and the purpose of giving the best possible services, a selected gastronomic offer, recreational contents, rewarding reviews with an increasing number of visitors, the complex is ideal for a prolonged tourist season. Baška is the most famous tourist center on the island Krk, the biggest island in the Adriatic Sea (40 578 ha), which position closest to the center of Europe. Baska's position has enabled uninterrupted growth and prosperity, as well as a distinctive the tourist scene, making the town one of the most popular tourist destinations of the Croatian Adriatic. Nestled in a quiet valley and in a bay surrounded by vineyards, olive-groves, with the picturesque background of the rocky Velebit mountain and island Prvić, which seem to shelter its unique 1800 m long pebbly beach, which rightly say that it is one of the most beautiful beach on the Adriatic. On Beach Vela flown European Blue Flag since 1999. Blue Flag beach has been awarded to the beach by European Foundation for Environmental Education (Foundation for Environmental Education in Europea - FEEE), and symbolizes a preserved, safe and pleasant environment, clean sea and coast, and equipment, decoration beach with an elaborate system of management team territory. On the beach you can rent kayaks, windsurfing boards, umbrellas, chairs and other beach gear needed for an enjoyable vacation. 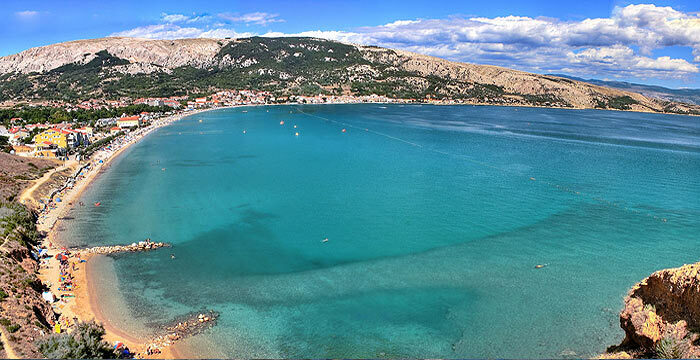 It was the beaches that stimulated the development of tourism in Baska, long ago in the 1908th , when the first beach on the island officially opened. We offer total 65 facilities.